When I got married some 17 odd years ago, I was given this lovely trifle dish as a gift. Inside it were several recipes for trifle and a little note from the giver of the gift. Would you like to know what it said? You are just so nice and attentive like that. I was all over the idea of making an easy recipe that looked beautiful and tasted great. 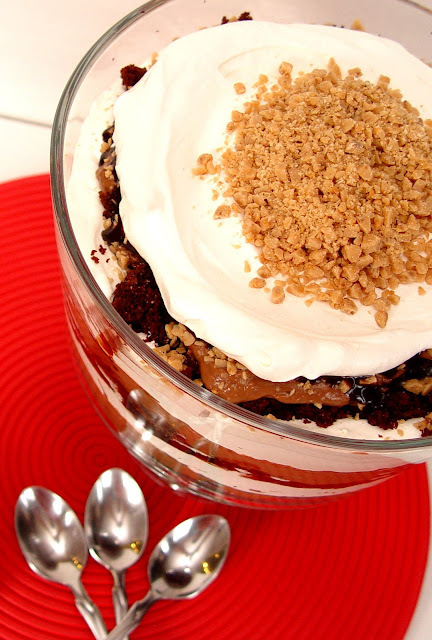 This Chocolate Toffee Trifle is just that, my friends. It’s as easy as baking up a cake mix, whipping up some instant pudding, and smoothing luscious layers one on top of the other. “you must be the most wonderful gourmet cook walking the planetttttttttt”. Come right along then, let’s do it! 1. Bake the cake according to package directions. Let it cool completely. 2. While your cake is cooling, beat the pudding with 3 C of milk until thick, should take about 3 minutes. 3. Chop up your cake into crumbs with a spatula. 4. Sprinkle 1/3 of the cake crumbs in the bottom of a trifle dish. 5. Spread 1/3 of the pudding over the top of the cake. 6. Sprinkle 1/3 of the toffee over the pudding. drizzle some Hershey’s syrup over the top. 8. Repeat the layers twice more. 9. Cover and refrigerate for at least 3 hours, and up to twelve. Oh, that looks delicious! Now I know what I want for Christmas. 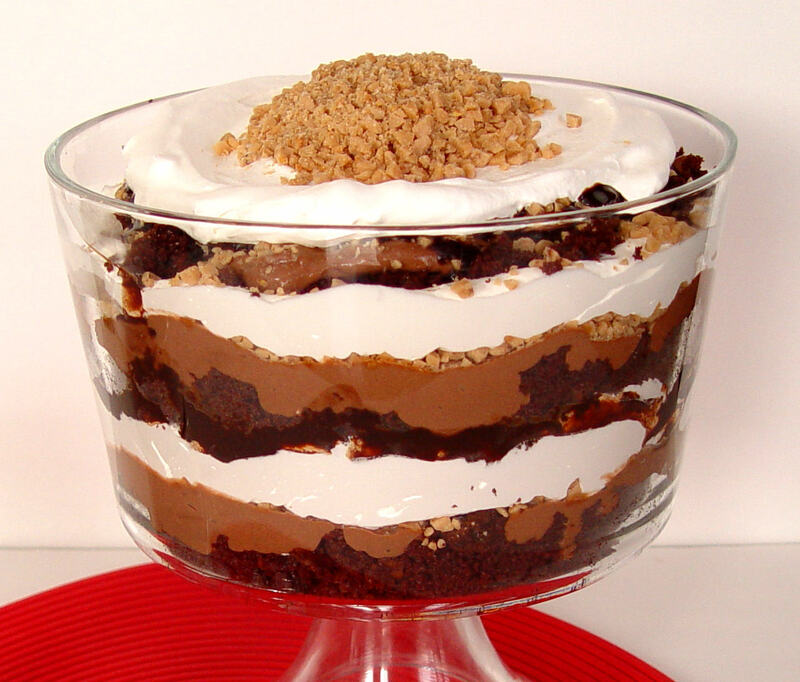 A trifle dish! I love trifles – easy and so many different possibilities. I will have to try this one. Wow that does look easy!! This is one that I think I will do for thanksgiving!! Thanks for the easy instructions! This is a crowd pleasing recipe that disappears quickly and gets lots of recipe requests! What a great idea! Thanks for sharing this tip. Have a great day. I made this for my work Thanksgiving party and oh my gosh they just about licked the dish…. Thanks! !